He first appeared on the corner in March with a tower of boxes & bags. Mangoes and oranges. Now, every afternoon I see him peddling his fruit, the most beautiful sunny smile on his tanned face. He is a popular guy. People look for him on their way home from work, while walking their dogs, and since he gives free fruit to the neighborhood kids, they love him too. Since he arrived, my daughter and I occasionally make our way over to his corner, taste his wares and buy a few mangoes for a snack. That is, until one day we were walking home from school and we saw new boxes. Stacked up high next to the mangoes were bright yellow boxes with the words STRAWBERRIES Grown in California scrawled across the front in red. Strawberries! 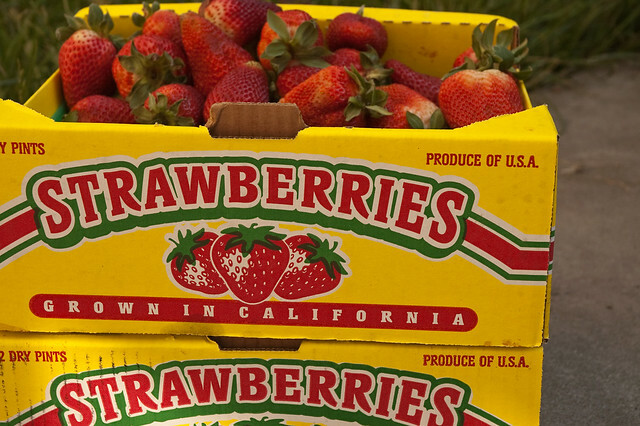 Probably grown in the extensive strawberry fields in Watsonville only 30 miles south of here. I buy a box, that’s 6 overflowing green baskets, for $10.00. What a deal! That’s about $1.66 for each basket. I search through my box expecting a few rotten ones hiding below and did not find a single one. Each berry is perfect, sweet, juicy. Now we buy a box of strawberries every week. They are always on the table. Simply rinsed and sliced. But, after two weeks of plain strawberries at every meal we needed something different. I found a Strawberry Cake recipe on MarthaStewart. com and got to baking. I made very few changes to the recipe. Her recipe called for 2 tbsp of sugar sprinkled on top and that seemed excessive when I was sprinkling. I used about 3/4 tbsp and mine came out great. The top is stunning and the taste matches. It’s a lighter fluffy cake with a crispy outside that pairs perfectly with the soft fluffy interior. The sweetness in the strawberries concentrates and intensifies into a deep warm burst of flavor when you bite into it. It’s inspired me to try the roasted strawberries I have been hearing and reading about. 1. Preheat oven to 350 F. Butter a 10 inch pie plate or 10.5 inch cast iron skillet. Whisk together flour, baking powder and salt in a medium bowl. 2. Mix butter and 1 cup of sugar in a separate large bowl and mix on med-high with an electric mixer until the mixture is fluffy and soft, about 3 minutes. Reduce speed to med-low and add the egg, milk and vanilla. Mix until blended well. 3. Reduce speed to low and gradually add the flour mixture. Transfer the batter to the pie plate or cast iron pan and spread evenly. The batter will be thick. 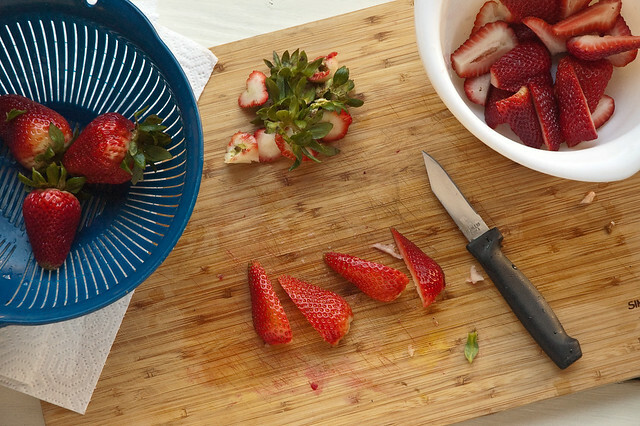 Arrange strawberries on top of the cake, cut sides down. I was not able to get all the strawberries on my cake. I had about 3 large ones left over. Sprinkle the remaining 2 tbsp of sugar on top of the cake. I thought 2 tbsp seemed like a lot when I was sprinkling so I used 3/4 tbsp and it came out fine. 4. Bake the cake for 10 minutes then turn down the oven to 325 F. Bake until cake is golden brown, firm to the touch and pulled away from the sides of the pan. About 55 min-1 hour. Let cool in the pan on a wire rack. Cut into wedges and serve. Cover loosely and store on the counter for up to 2 days. 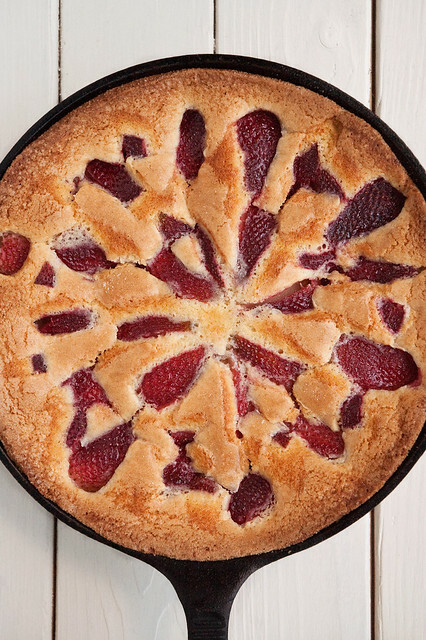 What a gorgeous looking cake, and a beautifully written post.Must try this soon…maybe with stone fruit. Your photos and description really make me want to eat this. I live in California too, and we are always looking for new ways to cook and bake with the beautiful strawberries. My husband buys them on his way home from work, at a field side stand. Always fresh and sweet. Man I wish I could find strawberries for that price around here! 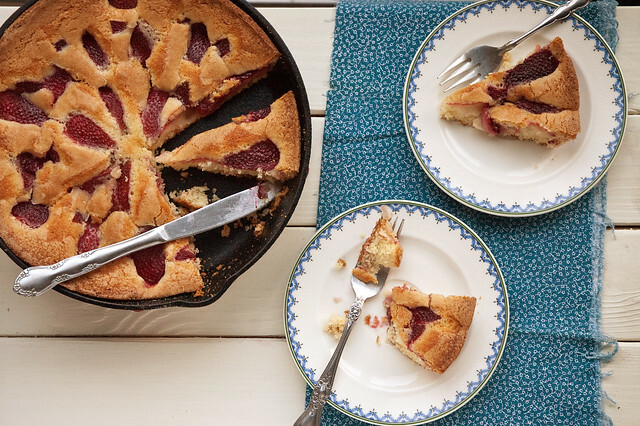 When it’s strawberry season I find it hard to eat them any other way than fresh, but if I had that many this cake would finds it’s way into my oven for sure!